While a salted rim, squeeze of lime, and top shelf tequila make many margaritas tasty, these Connecticut bars and restaurants stand out from the rest as they handcraft specialty margaritas using anything from local ingredients to rare tequilas and fresh juices to take the humble marg to a whole new level. Find your new favorite at one of these great spots. Boxcar Cantina works with local farmers to source ingredients for their menu with the aim to encourage local food consumption and sustainability. Their menu features homemade tacos, tamales, tacos, guacamole, and of course, an extensive drink menu with a selection of standout margaritas. If you can’t choose just one flavor, order their unique margarita flight, in which you can choose a variety of flavors for just $14. Enjoy handcrafted cocktails at Fresca Tequila Bar in out of the way Colchester. Numerous tasty restaurants have been popping up in town lately and Fresca Tequila Bar and Grill is definitely one such restaurant to add to your must-visit list. Ensure you’re feeling thirsty during your visit, as Fresca Tequila Bar and Grill’s skilled bartenders whip up excellent margaritas with stand outs being their Lana’s Lime in the Coconut, which includes 1800 Coconut Tequila, agave nectar, lime, and house sour, and the Tracy’s Spicy Peach marg, which is made from Tanteo Jalapeno Tequila, Stirrings Peach Liqueur, house sour, and lime. Let someone else be the designated driver when you visit Geronimo Tequila Bar, as the tequila selection here is the largest on the East Coast—it would definitely be hard to choose only one drink. Geronimo’s offers 10 different margarita options on the menu including the Timberlake, made from 901 Silver, Cointreau, pineapple, and lime and the Cucumber Cooler, which consists of cooling cucumber infused tequila, muddled cucumber and cilantro, Triple Sec, and lime. Sip on the Bartaco original margarita, which consists of Libelula Joven tequila, orange liqueur, agave syrup, and lime. Numerous other cocktails are also available on the menu if you are seeking a different tequila beverage. Accompany your drink with shareable delights, such as guacamole with chips and fried plantains, or order something for yourself like their pork tamale or cauliflower tacos. Find locations in West Hartford, Stamford, and Westport. Open since 1969, this long-standing establishment celebrates Mexican cuisine with an extensive menu of tacos, fajitas, and enchiladas. To accompany their delish meals, they also offer 16-ounce frozen margaritas in a variety of flavors such as strawberry, peach, and blue Curacao. Margaritas are served in a Ball jar with a salted rim and wedge of lime. Ocho Café offers a massive selection of tequila, all of which can be used to craft your own margarita suited to your personal preference. 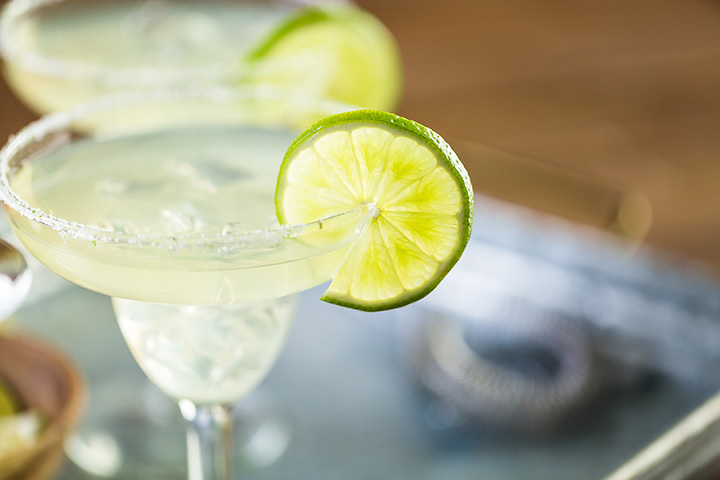 After selecting the grade and brand of tequila, opt for your mixer, flavoring, and then choose a sugar or salted rim. If you don’t feel like making your own, Ocho Café has several handcrafted margarita options on the menu. Ocho Café also serves margarita pitchers and these are on special on Mondays for half price. Grab a Tex-Mex meal and margarita with friends at this low-key, relaxing restaurant. Here at Lucky Taco, you can create your own marg, selecting from their fresh juice, fresh fruit puree, and infused or standard tequilas. The menu at Lucky Taco is just as exciting as their drinks menu, with a special menu section featuring fusion tacos including flavors from around the world; for example, their kung pao chicken taco, with tender chicken, hoisin sauce, peanuts, and an Asian slaw, blends flavors from East and West. Taco Loco offers diners a complete food menu and drinks are crafted in their full bar. The margaritas menu at Taco Loco is extensive, with separate sections for their specialty margs and frozen fruit-flavored margaritas. Their Anti-Oxidant Margarita is a unique option crafted with Azunia Silver, lime, agave nectar, blueberries, raspberries, and mint. If you have a hankering for a frozen margarita but are on a budget, Taco Loco offers a two for one special on Herradura margaritas every Tuesday. Take advantage of the warm weather with a meal and drink enjoyed outside at Sayulita. This hip Mexican spot features an array of tasty, shareable snacks, like empanadas and a salsa flight, salads, mains, and tamales. The full bar has ample mezcal and tequila options and uses these to create signature cocktails. Select one of their popular spicy margs or a handcrafted option off of their frequently changing cocktail menu. Rio Brave Tacos’ full bar is stocked with blanco, teposado, and anejo tequilas, which can be used to create your own margarita. Simply choose your preferred tequila, mixer, seasoning, and rim. To accompany your drink, Rio Bravo has guacamole handcrafted at your table plus a large menu of appetizers and mains. Find locations in Norwalk, Westport, and Fairfield.